I had been avoiding it so far, the pumpkin bread onslaught, but it was time, right? 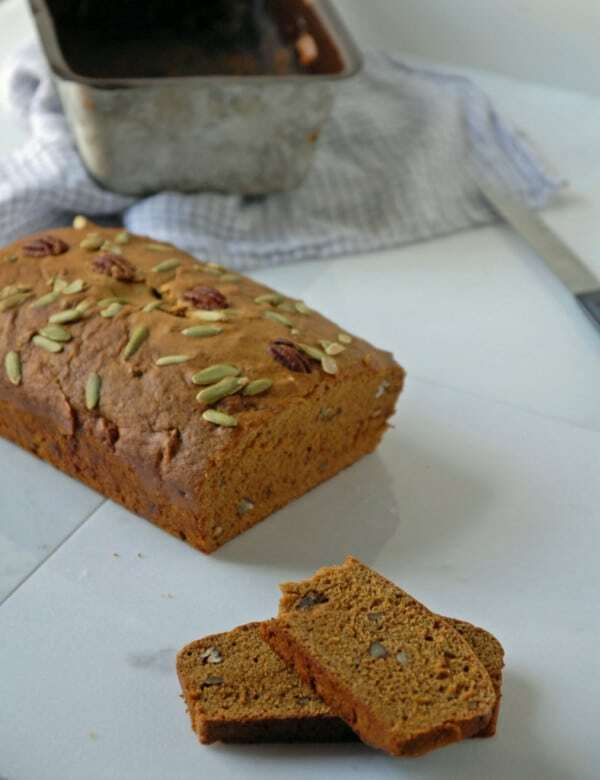 Once we hit November it’s all systems go for anything holiday-ish related and I’m all in with any kind of fall spiced holiday quick bread. I meant for this to be a dessert/snack for a few friends we had over a few days ago, but since they brought a pie to share, I’m hoarding this for myself! I adored that the pepitas (pumpkin seeds) on top got all roasty and extra crunchy while baking, love those toasted seeds! 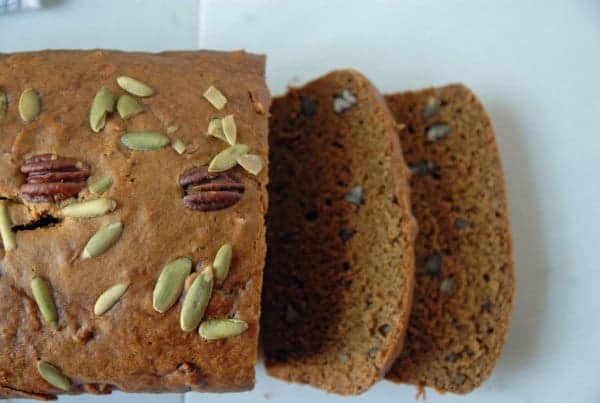 If I would have thought of it, I would have thrown a few handlfuls into the pumpkin bread batter next time, but alas, I’ll deal with eating the loaf just the way it is. Between possibly turning leftovers of this bread into french toast or just toasting it slice by slice, this is going to be dissapear in NO time in my house! Preheat oven to 350 degrees F. Grease 2 loaf pans, set aside. In a large bowl, combine all dry ingredients, set aside. In medium bowl, combine all wet ingredients and combine thoroughly. Add dry ingredients to the wet mixture and stir all the way through. Fold in pecan pieces and make sure batter is completely combined. Divide batter between the 2 loaf pans, distributing evenly. Garnish top of loaves with pecans halves and pepitas. Bake for 1 hour or 1 hour and 15 minutes, or until sharp knife inserted in center comes out clean. Remove from oven and let cool before removing from pans. This loaf is gorgeous! I love the toppings. 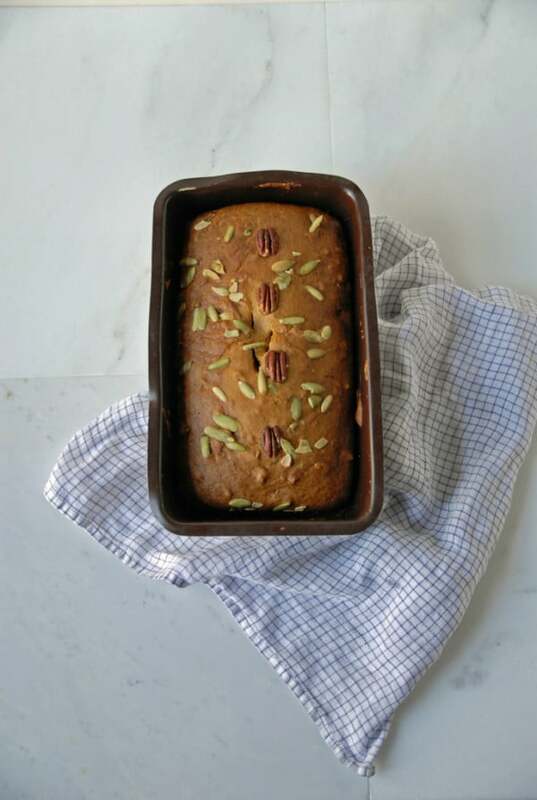 Love the addition of the pecans–I am a huge fan of nuts in my quickbreads! 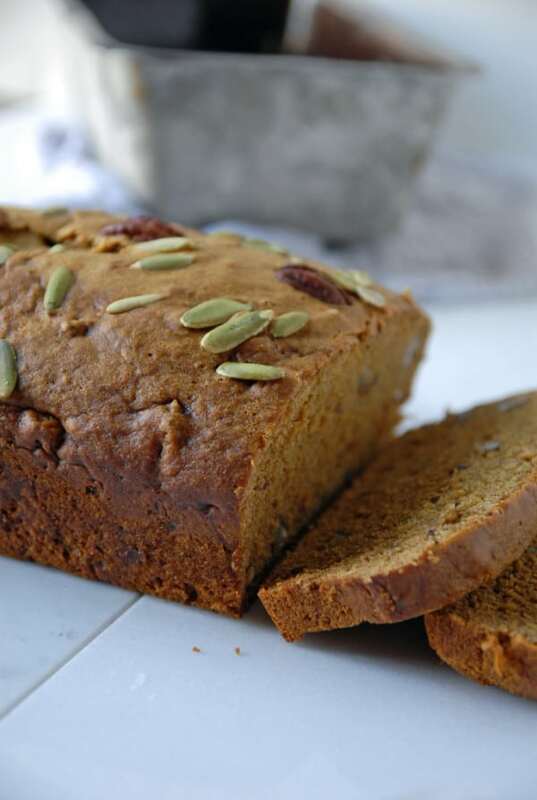 I love pumpkin bread and this one looks excellent! We are on the same page – I’m making pumpkin goodies too. Love your top-down shot! Thanks Corinne! So happy you found me and enjoy! Do you think oat or buckwheat flour will do? Hi Sandy! Yes, I think either of those flours would work, but I would keep in mind that it would yield a hearty bread, so perhaps using some oat or buckwheat flour and some all purpose would result in a good hearty/tender balance. Thank you for this recipe! I cut the sugar in half and I was short on pumpkin puree so I filled in the rest with some sweet potato puree and nobody noticed. I was so happy to use dates in a recipe. 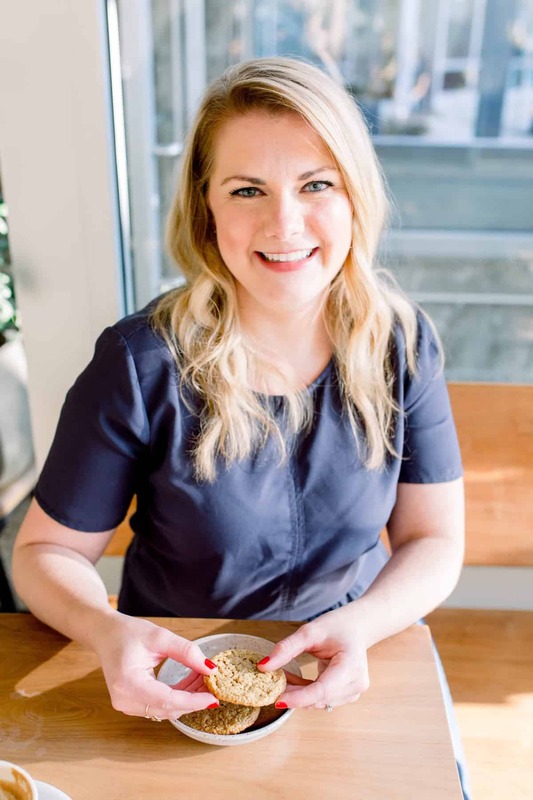 Hi, I'm Abby and I love all things sweet, with a vegan twist! If you have a craving for rich chocolate cake or love a flaky croissant as much as I do, you're in the right place! Get every recipe right into your inbox!